In this dwarf ornamental grass design, I'm using the "Little Bunny" fountain grass and placed them in a rock bed. For addiontional plants I added Salvia-Marcus, Blanket flowers and Feather Reed Grasses. I kept the spacing of the plants a little farther from each other, so at mature size you could still see the rocks. The Little Bunny works well in small backyard landscapes that require small dwarf type plants. It's mature size is only 10 to 12 inches wide and the same tall. It loves the sun and is a low water user. Dwarf ornamental grasses are perfect for dry river beds, rock gardens. It is great to add to a water garden as it won't overwhelm your theme. It's a perfect plant for containers too. The foliage during the summer is green and it blooms in late summer through the fall with white plumes. If planting in a perennial bed you can mix this dwarf fountain grass with other plants that have low watering requirements and love the full sun. Stonecrop, Sage, Lavender or Thrift would be excellent choices for additional colors. 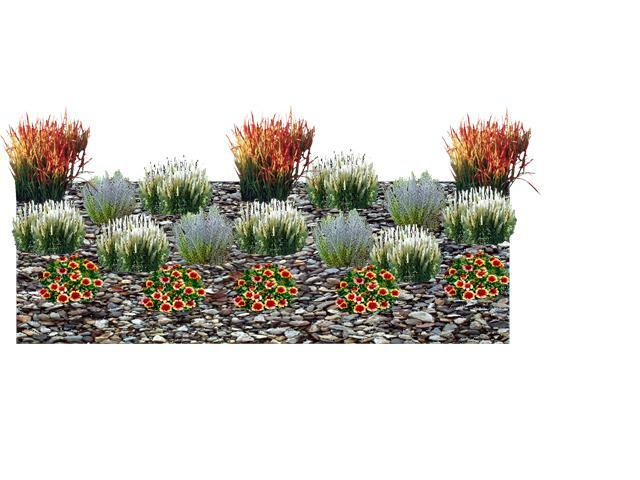 You could also use purple fountain grass or maybe Variegated Japanese Silver Grass instead of the Feather Reed grass. Some of these plants may not be available in your area, but you can find them on line. Here are a couple place to shop for your plants online.